That would be, of course, the fifth game of the World Series. So, in advance of the stirring triumph by the Sons of Willie Mays,* here’s a nice bit of baseball reporting and writing, one that captures something of the difference of the game fans watch and that which the players play. Even a Boston-fan-in-adulthood like me knows the lore. Ted Williams announced on September 26, 1960 that he was going to retire at the end of the season, two days later. That would be it for a major league career that had begun in 1939. (For those who are counting, that’s a career that spans four decades, and includes hiatuses for active duty in two wars.) That season, aged 41, he wasn’t too bad: a .316 batting average, an OPS of 1.096, 29 home runs in 113 games. The numbers are a little down from his career averages (sic! ), but you’d have to say that the Splendid Splinter could still play. What happened that day is pure Boston sports legend. Fisher, after his unsettling wait, was wide with the first pitch. He put the second one over, and Williams swung mightily and missed. The crowd grunted, seeing that classic swing, so long and smooth and quick, exposed, naked in its failure. Fisher threw the third time, Williams swung again, and there it was. The ball climbed on a diagonal line into the vast volume of air over center field. From my angle, behind third base, the ball seemed less an object in flight than the tip of a towering, motionless construct, like the Eiffel Tower or the Tappan Zee Bridge. It was in the books while it was still in the sky. Brandt ran back to the deepest corner of the outfield grass; the ball descended beyond his reach and struck in the crotch where the bullpen met the wall, bounced chunkily, and, as far as I could see, vanished. Yup. 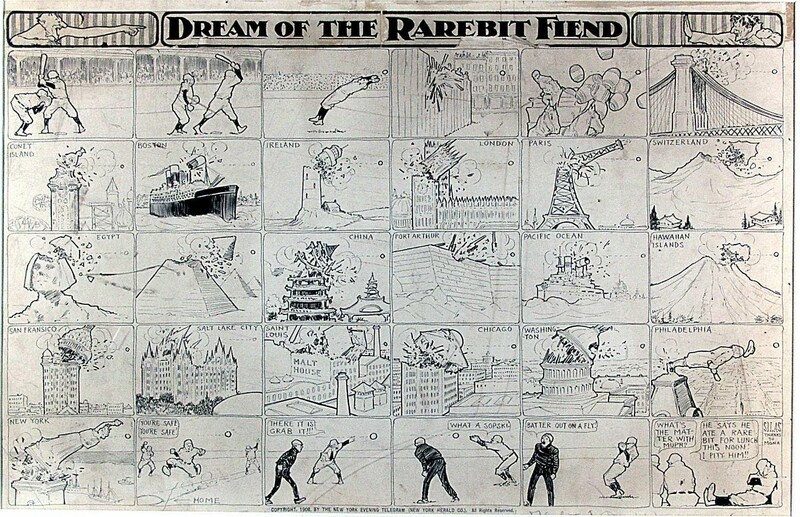 As every baseball fan knows, Williams went out with the stuff of dreams, a home run in his last at bat in the only home stadium he had ever known in a baseball life as long (and now as long ago) as Methuselah’s. As Updike notes, he was even able to allow himself to skip the final series of the 1960 season, away games at Yankee Stadium. A home run, a standing O, no curtain call, and out. That’s the story. Full stop. Except…s another guy had something to do with the moment, the antagonist to Williams’ hero’s role. That would be Jack Fisher, the pitcher who served up the fateful fastball. One of the sportswriters looked it up, and he said that Williams lifetime was two for thirteen off of me. So I did all right against him. As you probably heard, it was a very cold, dank day type thing. Williams earlier had hit a ball off of me to right field—a fly ball that our right fielder, Al Pilarcik, caught back close to the warning track. So Williams had hit the ball pretty well that time, and I thought, Uh oh, but it was an out. So, it’s the seventh inning, and he comes up, and Jackie Jensen was their next hitter, right-hand hitter, and with the short left-field wall there, I thought, There’s no way I’m gonna pitch around Williams. I think the first pitch was a ball. The next pitch—he swung and missed—was another fastball. The next pitch I just went to another fastball and he hit it out. Made the score four to three. I mean, all I was trying to do was win the ballgame. The fact that he hit the home run wasn’t that big to me because I’d actually had pretty good success against him. *I hope I may be forgiven my partisanship. My first pro sports experience was surviving Candlestick as a nine year old, or so. Saw Mays, McCovey, Marichal, Cepeda, Bonds the elder, even Gaylord Perry. I switched allegiance to the A’s after a bit — East Bay kid and all that — but I earned (though never grabbed) my Croix de Candlestick, and so there you have it. Go Giants! **Was Babe Ruth a better ball player? Probably. But, of course, that greatness happened mostly in a Yankees uniform. Goddammit. Image: Artist unknown, Diagram of the Method of Giving the Rotary Motion to the Ball, from Scientific American, The Art of Pitching in Baseball, July 31, 1886, page 71. Man, I so need a break from politics now. Given that the Party of Lincoln has decisively transformed itself into that of — oh who the hell knows…say Tomato Hookworm-Space Aliens, and we can’t seem to build asylums fast enough to cage the crazy, I just hit the wall. I know that I haven’t been posting much lately — the consequence of a summer deconstructed by the there-and-back-again frenzy of trips to surreal cities (Shanghai, Qatar) and the blessed internet-free cloister of the mountains. But truly, my (unaccustomed) silence is born of the sense that the fools and knaves really have managed to gut the American, and perhaps the human experiment for good and all — or at least for that foreseeable future that includes my son’s maturity. I don’t actually think that’s necessarily true, for a lot of reasons, including this one. But still and all, it is good to read some stuff that had nothing to do with dominion and the amount of creativity some people can bring to bear on screwing the most vulnerable among us. At a glance, a painting by Jackson Pollock can look deceptively accidental: just a quick flick of color on a canvas. A quantitative analysis of Pollock’s streams, drips, and coils by Harvard mathematician L. Mahadevan and collaborators at Boston College reveals, however, that the artist had to be slow — he had to be deliberate — to exploit fluid dynamics in the way that he did. The linked article at the Harvard Gazette is a bit of bait and switch. Pollack wasn’t a physicist, of course, except in the sense that one of the qualities that distinguishes a great center fielder, for example, is the ability to solve the equation describing the curve traveled by a batted ball swiftly (and subconsciously) enough to make the most astounding catches seem …routine (almost). 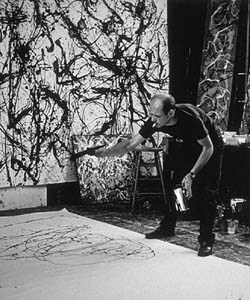 Pollock’s signature style involved laying canvas on the floor and pouring paint onto it in continuous, curving streams. Rather than pouring straight from the can, he applied paint from a stick or a trowel, waving his hand back and forth above the canvas and adjusting the height and angle of the trowel to make the stream wider or thinner. Simultaneously restricted and inspired by the laws of nature, Pollock took on the role of experimentalist, ceding some control to physics to create aesthetic effects. The hunt for a deep connection between science and art is an old preoccupation of practitioners of both of those creative crafts. I’ve written about instances of this cross-cutting desire in a couple of my books — Bach’s joining of the “society of musical sciences” in 1747; Einstein’s invocation of aesthetics, (calling Bohr’s 1913 theory of the atom an instance of “the highest form of musicality in the sphere of thought)” and so on. Einstein’s quote captures what I think of as the nexus of the art-science connection: a shared sense of both method and motivation. For motivation: artists and scientists don’t always find it easy to articulate why they do what they do — but when they reflect out loud on such questions, they regularly do in language that sounds strikingly similar. Both guilds celebrate the pleasure of a rich problem, the joys of working things out, the sense of seeking deep truths and so on. The artist, of course, must have discovered the effects he could create through experimenting with various motions and types of paint, and perhaps some intuition and luck. But that, said Mahadevan, is the essence of science. That’s a bit of a waffle, I’ll admit: artists and scientists work the same way — except when they don’t. But still, I get the point imperfectly made in that quote: artful people across a wide range of domains share some crucial qualities of mind. Here, Mahadevan calls out the two I think of as vital: a delight in empiricism, and that sense of wonder in the face of material existence that sparks in the imagination glimpses of solvable problems. That’s about all I would want to say on this, so I’ll sign off, with just this one last, probably unnecessary swerve back to my immediate political neuroses. There are lots of ways to parse the catastrophic state of the Republican Party now — and by catastrophic, I mean for the nation, in that I don’t care if the GOP goes the way of the Whigs, but I’d rather they didn’t do so by partying as if it were 1861. But to all of that I’d add this: what’s been striking in the know-nothing ascendency in the GOP — the Rick Perry phenomenon and all the rest — is not so much that a grifter-Texan would have a pitch-perfect feel for every neurosis of the Republican primary electorate. It’s that people who actually really do know better — I’m looking at you Mitt Romney — are trying to toe the same line, parroting the orthodoxy that empirical knowledge matters not in the face of certain revealed truths, and that active human agency (government!) cannot solve problems. Artists, they are not. Scientists neither. In power they should not be. Images: Jackson Pollack at work in his East Hampton studio, before 1956. 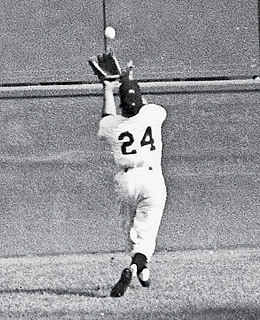 Willy Mays’ game-saving catch in Game 1 of the 1954 World Series. Baseball is a precise mirror of who we are, and I can’t recall a time that was more evident, particularly considering the deep emotional, communal, and personal impact, than during the 2004 ALCS when the Red Sox overcame the Yankees,’’ said Burns. Arrrgh! Bullsh*t. Baseball is many things, and I enjoy it greatly, and I thrilled to the events of 2004, made yet more rich by the disasters of 2003. But it is not “a precise mirror” of anything but, perhaps, itself. It may offer metaphors, of course, and a genuinely penetrating examination of the dynamics of the game and the business of baseball could illustrate a some of what matters in America these days — no exploration of the Red Sox triumph of that year would be complete without diving into the steroid-scummed waters of the performances of Ramirez and Ortiz, for example. But this malarky about “emotional, communal and personal impact” is an example of why I so loathe much of what Burns does as a historian. Given the choice between easy myth and stilleto cut to the heart strings vs. actually coming to grips with what happened and why — he goes all kleenex and swelling orchestras on you. Every time. His stuff is superficially persuasive. He’s got that style down, the lugubrious (“serious”) pacing, the soft musical bed, and the one aspect of his practice that is truly first rate, those exceptionally well done interviews stitched together with often brilliantly shaped archival spoken words. But the substance is designed to coddle his viewers, not to challenge them. He’s a myth maker, not a historian — and right now, when we are drowning in manufactured myths, just the thought of another Burns’ extravaganza turns my stomach. And then there is the sheer greed and sloth involved in Burns’ current plans and pleas. Now that he is no longer the largest receipient of corporate welfare in the PBS system, Burns has decided to milk the regular channels of PBS funding as hard as he can, potentially squeezing out dozens of hours of television in which the equivalent of watching grass grow — those endless pans across sepia photographs — are not actually seen as production values. For example: I have heard through the gossip channels that run through PBS that Burns intends to submit funding applications to the NEH in every funding cycle. This is inside baseball I know (and as gossip, should be accorded the truth value such sourcing always enjoys), but if true, this puts significant pressure on the development and production of novel and original voices. That’s simply bad, but rational behavior. Burns likes making films, has certainly earned an audience, if not this pair of eyeballs, and there is no law against seeking any dollar of funds that might conceivably fall one’s way. But recall that in this particular instance Burns proposes an update of an already broadcast and, IMHO, bloated series on baseball. He’s doing a bit of an update — got to keep the shop going, after all — but the bulk of this broadcast and something along the lines of three to four percent of PBS’s primetime air for the entire year, will disappear into maw of a massive rerun. That’s the sloth part — indolence on Burns’ part and on PBS’s. Leave aside the unlovely diction (“impactful.” Pah!) and what you have is a very well-budgeted production seeking unique visual material for free. Burns is well known around New England documentary circles for this kind of thing, for poor-talking his crew, his artists and his sources of archival material. I’ve worked with crew members who worked at cut rates for Burns in the wake of his pleas of poverty. He is very good at striking enormously advantageous deals with young and inexperienced musicians — caveat vendor, of course, but still. And I’ve run into the consequences of his enormously persuasive gift for getting people who should know better to give him unique visual resources for free. More than once I’ve had to talk down curators who wanted to get from me all the money they felt they should have charged Burns. Again, caveat vendor, as they now all do. The usual grievance was that Burns underrepresented the non-broadcast secondary market into which he planned to sell work that contained images, and people supplying, as they thought, a nonprofit educational venture with material at their nonprofit rates felt deceived. So here Burns is turning to another source. Not newspapers or the commercial or public archives, but you and me. And he asks for generosity. His prerogative, and if you want to have a shot at getting your pic on TV for a few seconds, go for it. But don’t forget. Burns is trying to get something for free that most people pay for. Nice work if you can get it…but I don’t like it. There. I’m not sure if I feel much better, but pouring out a bit of bile helps. I’ve been grieving this week, and yesterday’s Supreme Court decision, ratifying what will be, I’m afraid, the decisive erosion of both the American claim to exceptionalism and of American power worldwide, has left me almost unable to move one finger after another at the keyboard. So yes, I know that in the great scheme of things, the success of a minor con man peddling wares to the network that now reaches, on average, less than one percent of American households every night, is less than trivial. Still it gives me a start. More rage to come. Gammons is what I wish our political reporting elite were like. * He is absolutely committed to knowing both the horserace/gossip stuff — and to understanding what’s going on within and to the game that is his passion. He’s also just a good guy, a mensch. ** I have only met him once, back when I worked as a producer for the NOVA series at WGBH. He had come by the station to do some kind of satellite uplink, probably for ESPN, and I and a truly baseball/Red Sox-mad post production buddy of mine happened to be walking down the hall as he crossed our path to the exit to head on back to his real job. He stood there in a bare hallway, in the middle of a working day, talking to two young strangers about baseball, and he kept going — twenty minutes, maybe half an hour. He clearly just loved talking the sport, was happy to teach anyone willing to listen, and was a master of what I heard E. O. Wilson once describe as the essence of instruction: treating your (his) students as colleagues with less knowledge. After that half hour our private Gammons-led seminar was over, and the three of us split down three different paths. I’m sure he remembers nothing of this one conversation about baseball among thousands. But I do — the kindness and generosity more than any specific thing that he said. And for sure, his is the kind of mind and heart you want covering something important in the world. The good news, from my point of view, is that Gammons is leaving ESPN, but not New England — so those of us in range of the local sports net will still get to drink from that particular fount. *And science for that matter. One of the things that I and my colleagues at the MIT Graduate Program in Science Writing try to emphasize is that we are not translators. The job isn’t to tell the public what any given scientist or “science” in general thinks that audience should know. Our job is to make sense of both the results of scientific inquiry, and of the enterprise that produces such outcomes. It’s harder than it looks…believe me. **Someone near and dear to me was recently on a tenure and/or hiring committee at a prestigious local institution. A letter in support of a candidacy she was required to assess referred to the candidate as a mensch. She, not versed in Yiddish, did not know the word, and told me that she thought it inappropriate in such a venue, which I guess it is; the formal and fraught world of jobs and promotion in the academy is nothing to play games with, linguistic or otherwise. But here? Gammons is nothing so much as a mensch in all the full idiomatic glory of the word. So say I, and as its my blog, so it goes. 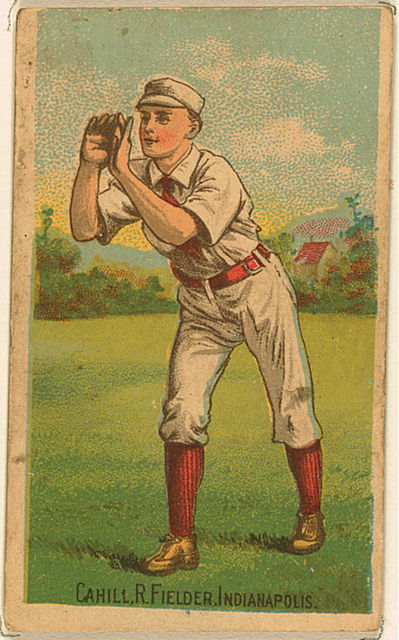 Image: D. Buchner & Company, Baseball Card of John Cahill, Indianapolis Right Fielder, 1887. …is a good day. Red Sox 1/2 a game in front of the Evil Empire, 1/2 behind the Orioles. I’m very happy (rain delayed) baseball is here. Image: Cy Young baseball card 1911. (between Boston stints). Who knew? (h/t Tom Verducci.) Fidel intelligently criticizing play in the World Baseball Classic by the Japanese team and his own Cubans with a nod to the insights gained from sabremetric approaches to the game. I might be tempted to talk about the difficulty of modeling the kind of dynamic system that baseball represents, with its enormous range of possibilities to which is added the complication posed by the fact that the responses of people to the knowledge gained by the statistical study of baseball alters that terrain. Either this means our brave new world (that has such digitalia in’t) is truly manifest…or else all of us here in bloggy pastures have truly jumped the shark. 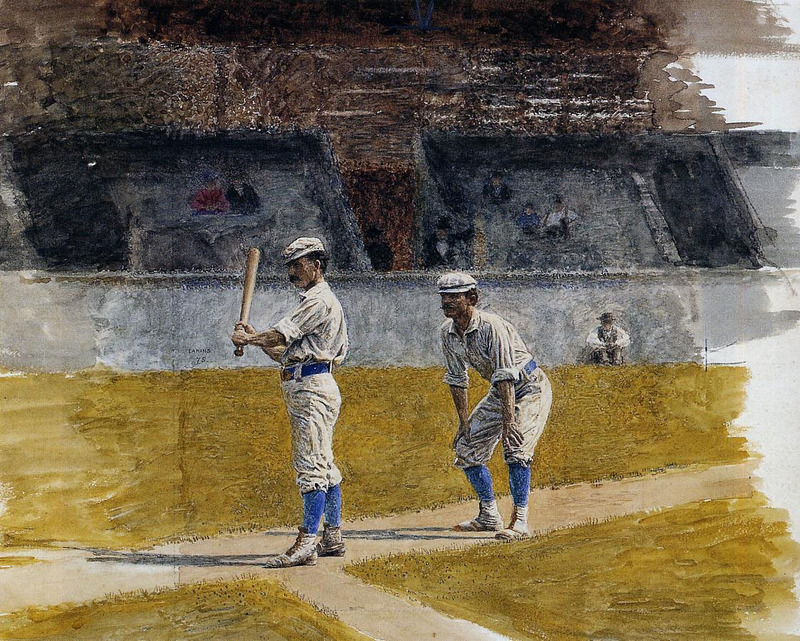 Image: Thomas Eakins, “Baseball Players Practicing,” 1875. *The site seems legit, but I’m no kind of a Cuba expert, and I could see the joy possible in a fake Castro blog. For the purposes of this post, I’m prepared to file this in the too-good-to-check bin of blogospheric delights. but as with any claim on the internet, if you need to know the material contained within, channel a (very) little bit of Ronald Reagan here and Trust, But Verify.